It’s super easy to customize with your favorite veggies. And if you’ve had your eye on one, there’s a giveaway happening over on Instagram. For stovetop method: In a large 12" skillet, whisk together the soy sauce, hoisin sauce, vinegar, honey, sesame oil and cornstarch. Slowly whisk in the water and place on medium high heat, bringing to a boil until thickened. Transfer sauce to a heat safe bowl. Stir in 3/4 of the sauce, reserving the rest for drizzling at the end. Add the uncooked rice and gently stir in the water. Cook for 13-15 minutes, stirring occasionally, until most of the liquid is absorbed and rice is tender. Open lid and stir in the cashews. Remove from heat and drizzle with the reserved sauce. Serve hot garnished with with sesame seeds and green onions, if desired. Press the sauté button and preheat 2 minutes. Whisk together the soy sauce, hoisin sauce, vinegar, honey, sesame oil and cornstarch. Slowly whisk in water and bring to a boil, until thickened. Transfer sauce to a heat safe bowl. Rinse and dry the pot. Heat 2 tablespoons of sesame oil, add the chicken and season with salt and pepper. Saute for 2-3 minutes, until lightly brown. Add the garlic and ginger and cook for another 20 seconds. Add the bell peppers and carrots. Pour in 3/4 of the sauce, the uncooked rice and only 1 cup of water. Press MANUAL high pressure and set for 5 minutes. After 5 minutes, use a long wooden spoon to push the release lever over to venting and allow the pressure cooker to quick release for 10 minutes. 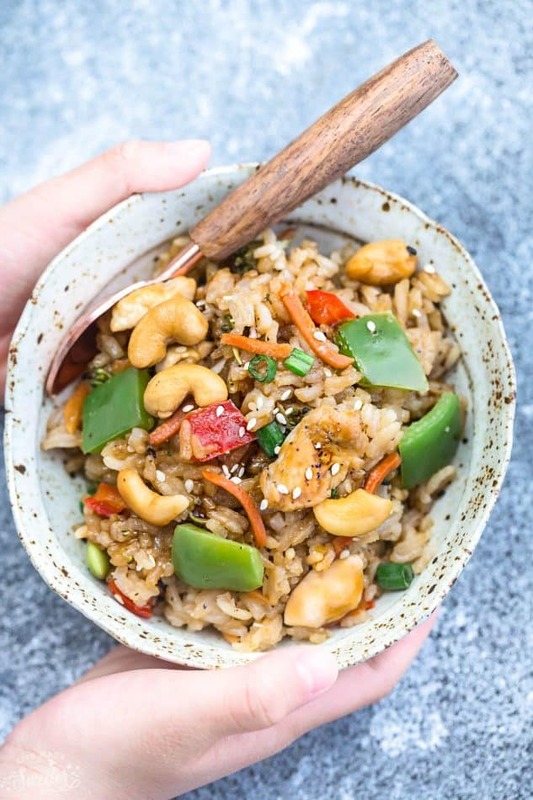 Remove the lid carefully and sprinkle in cashews, sesame seeds and green onions, if desired. Drizzle with remaining sauce and serve immediately. *Can also use Instant Rice - adjust covered cooking time to 5-10 minutes, or until rice is tender. **For brown rice, you may have to use more water or increase cooking time. Ever since getting my own Instant Pot last year, it has been a SERIOUS lifesaver. I still can’t believe how fast this summer flew but I really wanted to help one of you guys out with slaying your dinner routine once school starts! I’ve teamed up with Instant Pot and they are offering ONE of my readers a chance to win their own Instant Pot Multi-Use Programmable Pressure Cooker. It’s an awesome unit and I’m seriously wish I could give everyone one of these. All you have to do is head over HERE to enter. A winner has been chosen and notified. This is not a sponsored post but thank you to Instant Pot for sending me product to create this recipe as well as one for the giveaway!